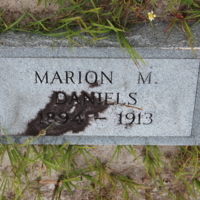 The headstone of Marion M. Daniels at Viking Cemetery in Fort Pierce, Florida. 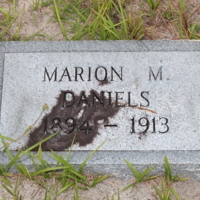 Daniels was born in 1894 and died in 1913. Viking Cemetery is one of the last remaining pieces of the small town of Fort Pierce, Florida. The area was first settled in 1892 by Major B. Daniels (1860-1947), who used the land largely to grow pineapple, a significant crop in Florida at the time. By 1895, Norwegian immigrant Jens Helseth (1858-1944) moved to the area and also grew pineapple on his 80-acre farm. From these early homesteads, the tiny village of Viking grew, named so due to the abundance of Scandinavian families who settled there. Helseth granted a portion of his homestead to serve as the community cemetery by 1905, the date of the first interment. It has since then served the descendants of Helseth, his family, and friends in the small community. The cemetery is today privately owned by the great-great grandchildren of Helseth, who maintain the site. 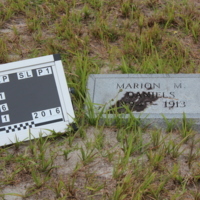 Original color digital images, January 14, 2016: Order 9, Field Specimen SL1161, Florida Historic Cemetery Recording Project, Florida Public Archaeology Network , Division of Anthropology and Archaeology, University of West Florida, Pensacola, Florida. Digital reproduction of original color digital images, January 14, 2016. Order 9, Project 1, Florida Historic Cemetery Recording Project, Viking Cemetery Collection, Florida Historic Cemenetery Recording Project Collection, RICHES of Central Florida. Originally published by Florida Public Archaeology Network. Copyright to this resource is held by Florida Public Archaeology Network and is provided here by RICHES of Central Florida for educational purposes only. Byrn, John D., Susan McSwaim, and Mary J. Wolf. St. Lucie County Almanac. Fort Pierce, FL: St. Lucie County Library, 2007. Rights, Lucille Rieley. A Portrait of St. Lucie County, Florida. Virginia Beach, VA: Donning Co., 1994. 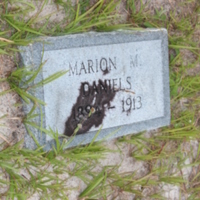 “Headstone of Marion M. Daniels at Viking Cemetery .” RICHES of Central Florida accessed April 18, 2019, https://richesmi.cah.ucf.edu/omeka/items/show/7279.